Let now consider the problem of closure in plasma fluid equations. There are, in fact, two possible small parameters in plasmas upon which we could base an asymptotic closure scheme. The first is the ratio of the mean-free-path, , to the macroscopic lengthscale, . This is only appropriate to collisional plasmas. The second is the ratio of the Larmor radius, , to the macroscopic lengthscale, . This is only appropriate to magnetized plasmas. There is, of course, no small parameter upon which to base an asymptotic closure scheme in a collisionless, unmagnetized plasma. However, such systems occur predominately in accelerator physics contexts, and are not really plasmas at all, because they exhibit virtually no collective effects. Let us investigate Chapman-Enskog-like closure schemes in a collisional, quasi-neutral plasma consisting of equal numbers of electrons and ions. We shall treat the unmagnetized and magnetized cases separately. The first step in our closure scheme is to approximate the actual collision operator for Coulomb interactions by an operator that is strictly bilinear in its arguments. (See Section 3.10.) Once this has been achieved, the closure problem is formally of the type that can be solved using the Chapman-Enskog method. The most significant feature of Equations (4.89) and (4.90) is the strong variation of the collision times with temperature. As the plasma gets hotter, the distance of closest approach gets smaller, so that both electrons and ions offer much smaller cross-sections for Coulomb collisions. The net result is that such collisions become far less frequent, and the collision times (i.e., the mean times between degree scattering events) get much longer. It follows that as plasmas are heated they become less collisional very rapidly. respectively. Here, use has been made of the momentum conservation law, Equation (4.25). Equations (4.93)-(4.95) and (4.96)-(4.98) are called the Braginskii equations, because they were first obtained in a celebrated article by S.I. Braginskii (Braginskii 1965). Moreover, use has been made of the conservation law, Equation (4.32). Let us examine each of the previous collisional terms, one by one. The first term on the right-hand side of Equation (4.100) is a friction force caused by the relative motion of electrons and ions, and obviously controls the electrical conductivity of the plasma. The form of this term is fairly easy to understand. The electrons lose their ordered velocity with respect to the ions, , in an electron-ion collision time, , and consequently lose momentum per electron (which is given to the ions) in this time. This means that a frictional force is exerted on the electrons. An equal and opposite force is exerted on the ions. Because the Coulomb cross-section diminishes with increasing electron energy (i.e., ), the conductivity of the fast electrons in the distribution function is higher than that of the slow electrons (because ). Hence, electrical current in plasmas is carried predominately by the fast electrons. This effect has some important and interesting consequences. One immediate consequence is the second term on the right-hand side of Equation (4.100), which is called the thermal force. 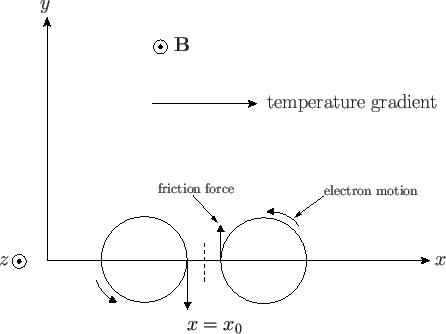 To understand the origin of a frictional force proportional to minus the gradient of the electron temperature, let us assume that the electron and ion fluids are at rest (i.e., ). It follows that the number of electrons moving from left to right (along the -axis, say) and from right to left per unit time is exactly the same at a given point (coordinate , say) in the plasma. As a result of electron-ion collisions, these fluxes experience frictional forces, and , respectively, of approximate magnitude , where is the electron thermal velocity. In a completely homogeneous plasma, these forces balance exactly, and so there is zero net frictional force. Suppose, however, that the electrons coming from the right are, on average, hotter than those coming from the left. It follows that the frictional force acting on the fast electrons coming from the right is less than the force acting on the slow electrons coming from the left, because increases with electron temperature. As a result, there is a net frictional force acting to the left: that is, in the direction of . It must be emphasized that the thermal force is a direct consequence of collisions, despite the fact that the expression for the thermal force does not contain explicitly. In fact, is defined so as to make the previous estimate exact. The term , specified in Equation (4.102), represents the rate at which energy is acquired by the electrons because of collisions with the ions, and consists of three terms. Not surprisingly, the first term is simply minus the rate at which energy is acquired by the ions due to collisions with the electrons. The second term represents the conversion of the ordered motion of the electrons, relative to the ions, into random motion (i.e., heat) via collisions with the ions. 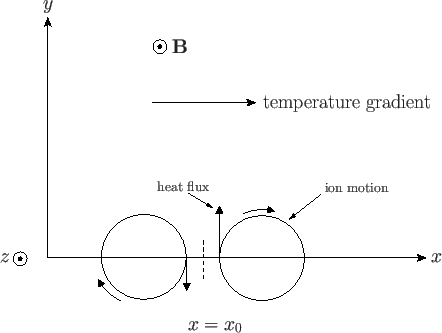 This term is positive definite, indicating that the randomization of the electron ordered motion gives rise to irreversible heat generation. Incidentally, this term is usually called the ohmic heating term. Finally, the third term represents the work done against the thermal force. This term can be either positive or negative, depending on the direction of the current flow relative to the electron temperature gradient, which indicates that work done against the thermal force gives rise to reversible heat generation. There is an analogous effect in metals called the Thomson effect (Doolittle 1959). It follows, by comparison with Equations (4.63)-(4.68), that the first term on the right-hand side of Equation (4.106), as well as the expression on the right-hand side of Equation (4.107), represent straightforward random-walk heat diffusion, with frequency , and step-length . Recall, that is the collision frequency, and is the mean-free-path. The electron heat diffusivity is generally much greater than that of the ions, because , assuming that . The second term on the right-hand side of Equation (4.106) describes a convective heat flux due to the motion of the electrons relative to the ions. To understand the origin of this flux, we need to recall that electric current in plasmas is carried predominately by the fast electrons in the distribution function. Suppose that is non-zero. In the coordinate system in which is zero, more fast electrons move in the direction of , and more slow electrons move in the opposite direction. Although the electron fluxes are balanced in this frame of reference, the energy fluxes are not (because a fast electron possesses more energy than a slow electron), and heat flows in the direction of : that is, in the opposite direction to the electric current. The net heat flux density is of approximate magnitude , because there is no near cancellation of the fluxes due to the fast and slow electrons. Like the thermal force, this effect depends on collisions, despite the fact that the expression for the convective heat flux does not contain explicitly. respectively. It follows, by comparison with Equations (4.62)-(4.68), that the previous expressions correspond to straightforward random-walk diffusion of momentum, with frequency , and step-length . Again, the electron diffusivity exceeds the ion diffusivity by the square root of a mass ratio (assuming ). However, the ion viscosity exceeds the electron viscosity by the same factor (recall that ): that is, . For this reason, the viscosity of a plasma is determined essentially by the ions. This is not surprising, because viscosity is the diffusion of momentum, and the ions possess nearly all of the momentum in a plasma by virtue of their large masses. Note that denotes a gradient parallel to the magnetic field, whereas denotes a gradient perpendicular to the magnetic field. Likewise, represents the component of the plasma current flowing parallel to the magnetic field, whereas represents the perpendicular component of the plasma current. The effect of a strong magnetic field on the perpendicular component of the thermal force is directly analogous to a well-known phenomenon in metals called the Nernst effect (Rowe 2006). Figure 4.1: Origin of the perpendicular thermal force in a magnetized plasma. The first two terms on the right-hand sides of Equations (4.120) and (4.121) correspond to diffusive heat transport by the electron and ion fluids, respectively. According to the first terms, the diffusive transport in the direction parallel to the magnetic field is exactly the same as that in the unmagnetized case: that is, it corresponds to collision-induced random-walk diffusion of the ions and electrons, with frequency , and step-length . According to the second terms, the diffusive transport in the direction perpendicular to the magnetic field is far smaller than that in the parallel direction. To be more exact, it is smaller by a factor , where is the gyroradius, and the mean-free-path. In fact, the perpendicular heat transport also corresponds to collision-induced random-walk diffusion of charged particles, but with frequency , and step-length . Thus, it is the greatly reduced step-length in the perpendicular direction, relative to the parallel direction, that ultimately gives rise to the strong reduction in the perpendicular heat transport. If then the ion perpendicular heat diffusivity actually exceeds that of the electrons by the square root of a mass ratio: that is, . There is an analogous expression for the electron flux, except that the electron flux is in the opposite direction to the ion flux (because the electrons gyrate in the opposite direction to the ions). Both the ion and electron fluxes transport heat along isotherms, and do not, therefore, give rise to any change in plasma temperature. Figure 4.2: Origin of the convective perpendicular heat flux in a magnetized plasma. The fourth and fifth terms on the right-hand side of Equation (4.120) correspond to the convective component of the electron heat flux density, driven by motion of the electrons relative to the ions. It is clear from the fourth term that the convective flux parallel to the magnetic field is exactly the same as in the unmagnetized case [see Equation (4.106)]. However, according to the fifth term, the convective flux is radically modified in the perpendicular direction. Probably the easiest method of explaining the fifth term is via an examination of Equations (4.100), (4.106), (4.115), and (4.120). There is clearly a very close connection between the electron thermal force and the convective heat flux. In fact, starting from general principles of the thermodynamics of irreversible processes--the so-called Onsager principles (Reif 1965)--it is possible to demonstrate that an electron frictional force of the form necessarily gives rise to an electron heat flux of the form , where the subscript corresponds to a general Cartesian component, and is a unit vector. Thus, the fifth term on the right-hand side of Equation (4.120) follows by Onsager symmetry from the third term on the right-hand side of Equation (4.115). This is one of many Onsager symmetries that occur in plasma transport theory. Obviously, there is a separate rate-of-strain tensor for the electron and ion fluids. It is easily demonstrated that this tensor is zero if the plasma translates, or rotates as a rigid body, or if it undergoes isotropic compression. Thus, the rate-of-strain tensor measures the deformation of plasma volume elements. Here, is the identity tensor, and . The previous expressions are valid for both electrons and ions. The tensor describes what is known as parallel viscosity. This is a viscosity that controls the variation along magnetic field-lines of the velocity component parallel to field-lines. The parallel viscosity coefficients, and , are specified in Equations (4.112)-(4.113). The parallel viscosity is unchanged from the unmagnetized case, and is caused by the collision-induced random-walk diffusion of particles, with frequency , and step-length . The perpendicular viscosity is far smaller than the parallel viscosity. In fact, it is smaller by a factor . The perpendicular viscosity corresponds to collision-induced random-walk diffusion of particles, with frequency , and step-length . Thus, it is the greatly reduced step-length in the perpendicular direction, relative to the parallel direction, that accounts for the smallness of the perpendicular viscosity compared to the parallel viscosity. The origin of gyroviscosity is very similar to the origin of the cross thermal conductivity terms in Equations (4.120)-(4.121). Both cross thermal conductivity and gyroviscosity are independent of the collision frequency.